Matthew Preston enters the Gallipolis Municipal Courtroom in August 2018 for his arraignment for the crime of aggravated vehicular homicide. GALLIPOLIS — A Crown City man pleaded guilty to the second-degree felony of vehicular homicide Thursday in the Gallia Court of Common Pleas, a crime which resulted in the death of Robert Baxter, 66, of Gallipolis. According to Gallia Prosecutor Jason Holdren, Matthew Preston, 38, faces potentially two to eight years, in increments of a year, in a state facility as per sentencing guidelines with the Ohio Revised Code and up to a lifetime suspension of a driver’s license in Gallia Common Pleas. 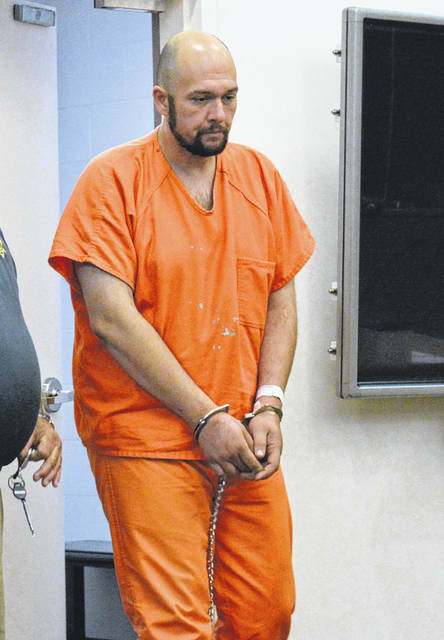 Preston is slated to be sentenced Jan. 28 at 9:30 a.m. in the Gallia Court of Common Pleas. The prosecutor said the state would be asking for the maximum sentence. The family of the victim has the option of potentially speaking at the proceeding, should they choose. Preston also was previously charged with two first-degree misdemeanor OVI counts and one second-degree misdemeanor possession of a drug abuse instrument as well as a minor misdemeanor for marijuana paraphernalia. He pleaded guilty Thursday to one OVI charge and one for possession of a drug abuse instrument in the Gallipolis Municipal Court. The other charges were dismissed. The convicted was sentenced to a mandatory fine of $375, a mandatory one-year license suspension, a maximum of 180 days in jail and credited with 156 already served because Preston never posted bond. His sentence will run concurrent with what was declared in Gallia Common Pleas as per the Ohio Revised Code. For the drug abuse instrument charge, he was sentenced to 90 days in jail, which he was credited with 90, having already served them. Holdren asked that Gallipolis Municipal Judge Eric Mulford consider at $2 million bond with a 10 percent surety in August 2018 because of reports that Preston had encountered law enforcement three times within 48 hours of Baxter’s death. According to complaint records and law enforcement interviews, each of those encounters reported that Preston had been potentially impaired and operating a vehicle with the last resulting in a collision and the death of Baxter. Mulford agreed and set the requested bond amount. Preston had previous encounters with law enforcement Tuesday, August 14, 2018. One encounter was reported to occur at a Rio Grande business where he was discovered unresponsive with keys in the ignition of a running vehicle. The second was reported at a business on Jackson Pike with Preston at approximately 11:30 p.m., the same Tuesday evening. He was arrested for OVI, after going through a field sobriety test, taken back to the Ohio State Highway Patrol post and processed for the reported incident. Preston was released into the care of an individual who had the situation explained to him, that Preston was still impaired, and who signed a release form to take Preston into their custody and care. Preston was released around 1:30 a.m. in the morning, August 15, 2018. The fatality which resulted in Baxter’s death happened around 12:37 p.m., that afternoon. Preston reportedly had traces of metabolized methamphetamine and heroin in his system after Baxter’s death. According to an earlier conversation the same August with Ohio State Highway Patrol Commander Barry Call, troopers had another incident at a gas station on Jackson Pike with Preston at approximately 11:30 p.m., the same Tuesday evening. He was arrested for OVI, after going through a field sobriety test, taken back to the post and processed for the reported incident. Preston was released into the care of an individual who had the situation explained to him, that Preston was still impaired, and who signed a release form to take Preston into his custody and care. Preston was released around 1:30 a.m. in the morning, Wednesday. The fatality which resulted in Baxter’s death happened around 12:37 p.m., that afternoon. OVI charges in Ohio are typically considered misdemeanors. An OVI charge becomes a felony when a suspect has three or more previous OVI convictions within a period of 10 years, according to 4511.19 of the Ohio Revised Code. According to Gallipolis Municipal Court online records, Preston had no previous OVI charges. Court reports say he had previous encounters with law enforcement over the last decade for various issues.